Do happy hour with Taos artisans on this walking tour. Experience Taos’ funky artistic spirit while investigating the city center’s rich artistic history. Weaving through winding alleyways and backstreets, explore the local art scene and engage with local craftspeople as they create their inspired creations. Then depending on the day, finish with happy hour fun either at Chokola Bean to Bar for organic, small-batch, exquisitely crafted chocolate or at El Monte Sagrado’s Anaconda Bar for an exclusive wine tasting. Get a quick taste of Taos’s great outdoor surroundings with this active half-day tour. 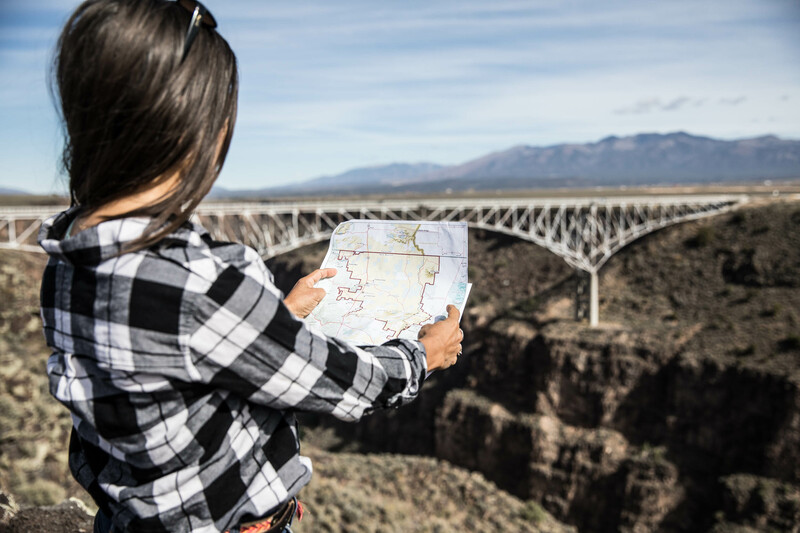 Journey to Taos’ outskirts to walk the seventh tallest bridge in the U.S., the Taos Gorge Bridge, and then take a nearby Rio Grande Del Norte National Monument hike on the La Vista Verde Trail. This 2 ½ mile, 6.400-foot round trip expedition offers breathtaking scenery and spectacular panoramic views of the raging waters within the plungingly step walled gorge at your feet. Want to quickly delve into Taos’ cultural depths? Visit the World Heritage UNESCO site of Taos Pueblo to see the oldest inhabited community in the U.S. and catch a glimpse of ancient Puebloan culture. Then, go to the Millicent Rogers Museum to peruse an incredible collection of Hispanic and Native American artifacts. Finally, complete your exploration of this center of Southwestern culture and living history by journeying to Taos Gorge Bridge. Go deeper than most visitors by learning and interacting with the Taos Puebloans through this horno bread baking tour. Learn about these adobe arched outdoor ovens and the best ways to shape and bake Puebloan bread, directly from a Taos tribal member. After making bread, walk through and explore Taos Pueblo, a World Heritage UNESCO site known for their continuously inhabited 1000 year+ adobe buildings, and then have lunch at a local grandmother’s café. Easily imagine old western movie backdrops with this journey from Taos to Ghost Ranch. Journey through red earth and multi-colored basalt covered in dusty green sagebrush on a 3-mile Chama River Valley hike to Chimney Rock. See why this sculpted textured land inspired Georgia O’Keeffe and learn about rare fossilized dinosaur discoveries. This tour highlights the stimulating vistas and prehistoric escapades of this glorious Northern New Mexico region. Explore Taos’ Puebloan culture and the land Puebloans have called home for 1000s of years with a visit to Taos Pueblo, Taos Gorge Bridge and the Rio Grande Del Norte National Monument. This interpretive guided experience highlights prehistoric dwellings and the stunning geological background of the Rio Grande Rift Valley. After exploring the village’s historical and modern-day contexts, see how the river has carved out an 800-foot descent through the thick lava walls of basalt rock and hike along the rim of this breathtaking landscape. The “High Road” goes through the Sangre de Cristo mountain range between Taos and Santa Fe. This tour traverses awe-inspiring scenery, provides a glimpse back in time to New Mexico’s Spanish colonial roots, and visits hidden away artists’ studios and historic landmarks. Go through Las Trampas to see the San Jose de Gracia church, wind through Ojo Sarco’s artist studios, experience Truchas village’s famed Dr. Rey Montez’ gallery, and finally taste Dixon’s Vivác Winery’s 100% New Mexican grown grape wine. Journey along the scenic Rio Grande corridor into the Rio Grande Del Norte National Monument on an active and immersive water and hike adventure. Starting with land, hike a 2 ½ mile, 6,400-foot round trip expedition that offers breathtaking scenery and spectacular panoramic views of the Rio Grande Gorge and famous Taos Box. Then by water, choose either a stand-up paddle board or kayak or raft for a mild to wild paddle experience of the Rio Grande River. Dry off over a riverside picnic lunch and finish off by winding down the day’s activities with a glass of wine, a pint of beer or a pint of local cider at VivácWinery. Experience the outdoor splendors of Taos, hear about the heritage and geology of this landscape and enjoy a locally grown glass of wine, with this unforgettable hiking expedition. This active tour goes deep into the Rio Grande Gorge with an informative look at her current-day free flowing waters and an understanding of her historical geologically shaping forces. Hiking a 2 ½ mile, 6,400-foot round-trip rim trail offers not only breathtaking scenery but also an opportunity to learn about the elements that have shaped this stunning landscape. To round off the day, enjoy a picnic lunch paired perfectly with local wine tastings from Vivác Winery. Fulfill a fly-fishing bug by casting a line across pristine watery expanses in isolated high mountain terrain. This tour is for people who wish to commune in New Mexico’s’ glory while trying to catch a variety of either warm or cold-water fish species. Fortunately, New Mexico weather allows for year-round fishing and has a large selection of both public and private river destinations. Thus, with a choice of watery locales, a wide variety of fish and a year-round climate, New Mexico has something for every type of angler to enjoy. If you can walk, you can snowshoe. Float on snow in a snowshoe only designated section of Carson National Forest. Amole Canyon offers unsullied old growth ponderosa pine as well as excellent conditions for all levels of snowshoe experience. After a snowshoe strapping demonstration, pole fitting and short safety talk, enjoy two miles of quiet blanketed wilderness at over 8.000 feet. This tour can also be paired with an afternoon wine tasting. This three-day, two-night glamping experience features the best of Taos hiking in the Rio Grande Valley, stand-up paddle boarding on Lake Abiquiu within Georgia O’Keeffe Country, farm-to-table dining and sleeping in a fusion of glamour and Taos camping. Journey With Us and read how we have cultivated this experience in our Travel Blog and our first Perseid Meteor Experience. Explore Taos. Enjoy our popular Half & Full Day Excursions Year Round.